← Are you sure you have input a date correctly in Excel? When you type “1/5/2015” into Excel, do you know whether it is “1st of May, 2015” or “5th of January, 2015”? The answer: It depends! Depends on what? 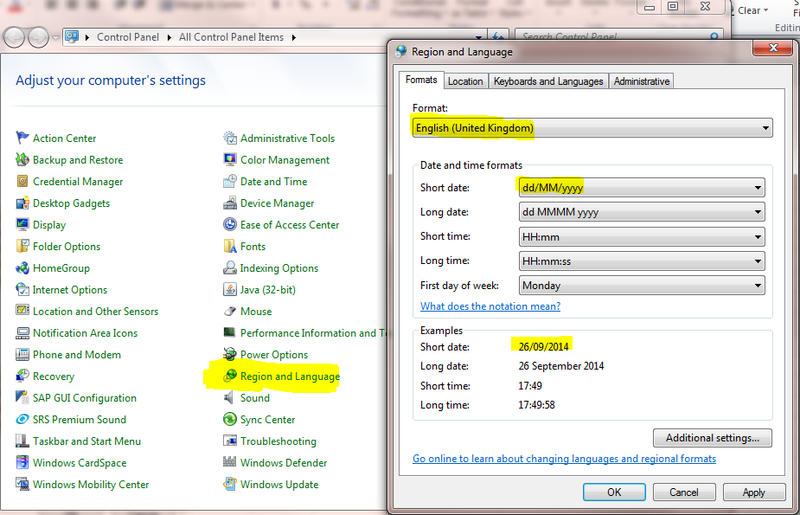 Depends on the Region and Language Setting in your PC. However, there are cases that people just input D/M for current year. It’s fine, but you really need to pay extra attention, especially if you are working on a d/M/yyyy setting. Why? There is no conflict for resolving the data as D/M for the 1st three lines. Either 5 or 1 is valid month number. Excel treat them as D/M and current year. Note: If the cell format is not set to short/long date, you will see “May-14” after you input “5/14”. This “May-14” could be misleading. It means “May 2014”, NOT “14th May” Make sense now? 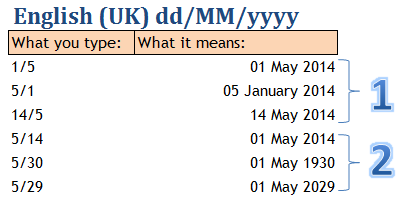 Wait… why “5/30” gives “1st of May, 1930″ while “5/29” gives “1st of May, 2029″? Very good observation. By default, when year is input as 2 digit number, Excel treats 01-29 as 20xx; 30-99 as 19xx. Last but not least, do not use apostrophe ( ‘ ) to enforce date input as text. If you need special format, do it with custom format. This entry was posted in Excel Basic and tagged Date. Bookmark the permalink. 1 Response to What we need to know about inputting Date in Excel?